I had a few ideas but had to go with what was available. Can you believe my husband picked this month to buy fancy beer that involved a stopper instead of a bottle cap? So many things I could have done with that. 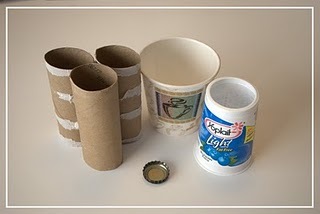 What I did have were plenty of paper towel and toilet paper tubes, and thus was born the decoupage and fabric flower napkin ring! I’m sorely wish I had another set of cloth napkins. I guess that’s my next project! These were super easy to make. I cut my tubes into 2 inch cylinders, cut 2 inch strips of fabric and decoupaged them on. I then made a few types of fabric flowers and hot glued those to the rings. Viola’, ready set dinner accessories. Those turned out SO cute!